Jumpin’ Jungle Cat of Jupiter! It’s another mega-collection of four complete novels of the “Man of Tomorrow,” the “Wizard of Science,” the protector of the Solar System and a menace to evil-doers throughout the universe: CAPTAIN FUTURE! Now that Captain Future (aka Dr. Curtis Newton) and the Futuremen (Grag the robot; Otho the Android; and Simon Wright, the Living Brain) have traveled through time in the final story of Volume Two (See “The Lost World of Time”), can an adventure beyond the Solar System be far behind? Most assuredly not! The Futuremen board their trusty space-vessel, The Comet, and blast-off for adventure in QUEST BEYOND THE STARS! But that’s not all the dangers our intrepid defenders will face in VOLUME THREE. Up next is OUTLAWS ON THE MOON! When the peoples of the Solar System believe the Futuremen to be dead, what better time for the emissaries of villainy to attempt to break in to Captain Future’s Secret Moon Base. Following that nail-biting saga, is arguably the finest of the CAPTAIN FUTURE novels: THE COMET KINGS. Here, author Hamilton pulls out all the stops as the Futuremen combat forces from within Halley’s Comet! In the final story of this volume, PLANETS IN PERIL, the Futuremen face forces from another dimension that threaten to enslave our entire universe! 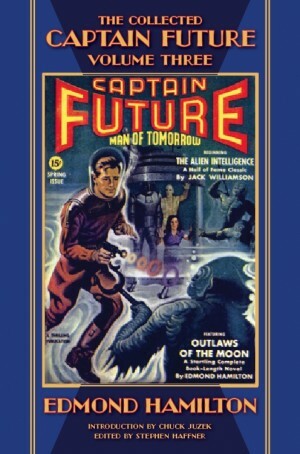 As with the previous two volumes of THE COLLECTED CAPTAIN FUTURE, “Under Observation,” the CAPTAIN FUTURE letters column is reprinted, and the original pulp covers and interior illustrations are reproduced in a generous appendix.